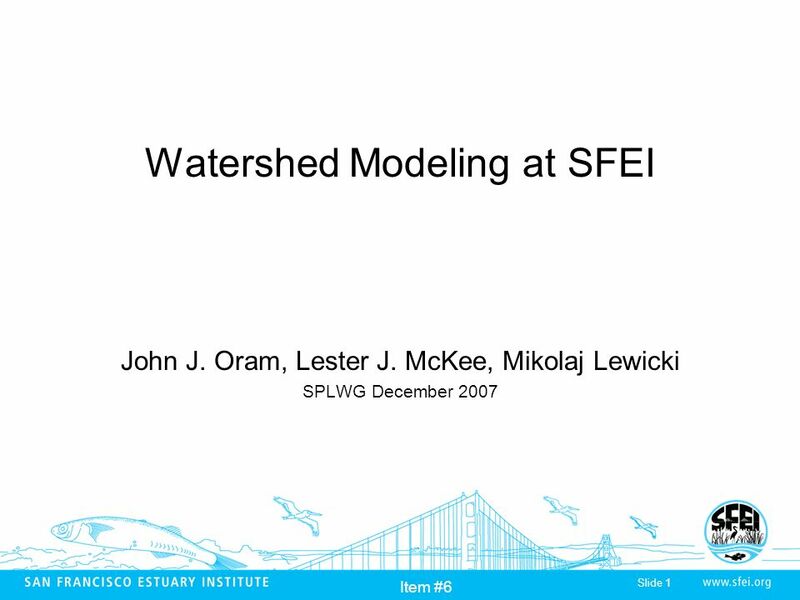 Slide 1 Item #6 Watershed Modeling at SFEI John J. Oram, Lester J. McKee, Mikolaj Lewicki SPLWG December 2007. 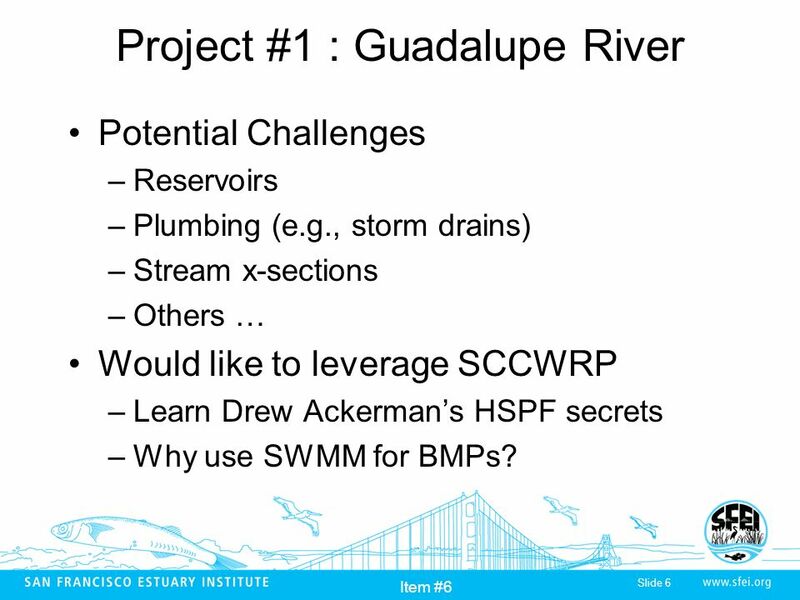 6 Slide 6 Item #6 Project #1 : Guadalupe River Potential Challenges –Reservoirs –Plumbing (e.g., storm drains) –Stream x-sections –Others … Would like to leverage SCCWRP –Learn Drew Ackermans HSPF secrets –Why use SWMM for BMPs? Download ppt "Slide 1 Item #6 Watershed Modeling at SFEI John J. Oram, Lester J. McKee, Mikolaj Lewicki SPLWG December 2007." 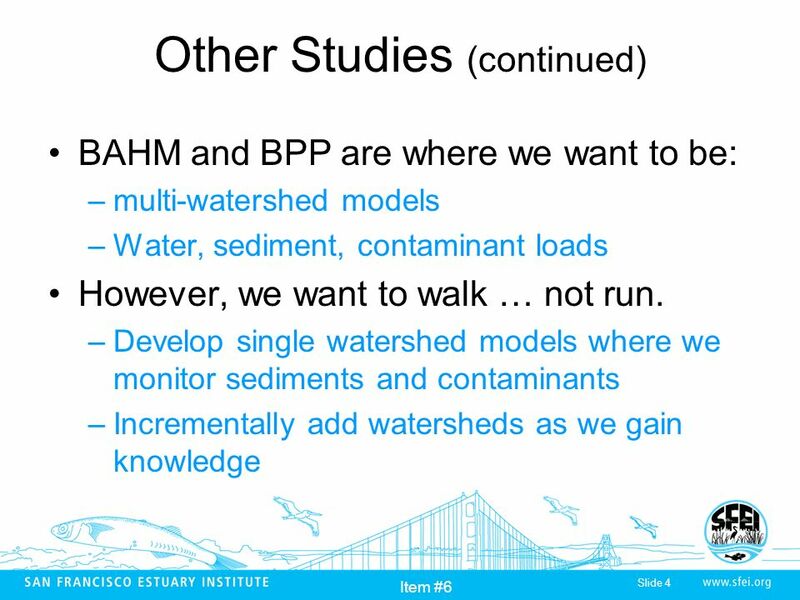 EMAP Efforts in SF Bay Overview of EMAP Western Pilot Overview of Coastal component Activities in SF Bay (FY 2000) Relationship to other SF Bay efforts. Item #6b 1 Towards a Bay Area Watershed Model Presented to the SPLWG May 14, 2008 John Oram & Lester McKee. Guadalupe River Hg Monitoring WY 2010 Jen Hunt Sources, Pathway, and Loading Work Group May 27, 2009 Item #3. 1 Introductions and Review of Agenda Lester McKee (Chair) Sources Pathways and Loadings Workgroup December 8, 2008 Item #1. 1 Hayward Zone 4 Line A Watershed Modeling Item #2a-2. 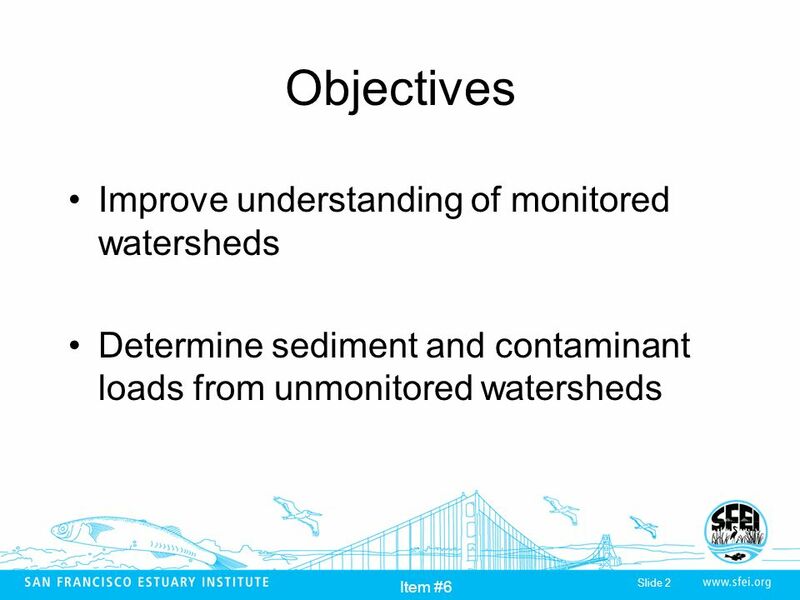 San Francisco Estuary Institute Small Tributaries Loading Study #2 Zone 4 Line A, Cabot Blvd. Hayward Year 2 – Draft Data To-date Sources Pathways and. Suspended Sediment Loads from Bay Area Small Tributaries Mikolaj Lewicki and Lester McKee Sources Pathways and Loading Workgroup May 14 th 2008 Item #3a. Sources Pathways and Loading Workgroup Announcements Item #1. Draft Strategy Revised RMP Modeling Strategy John Oram Jay Davis Item #8. 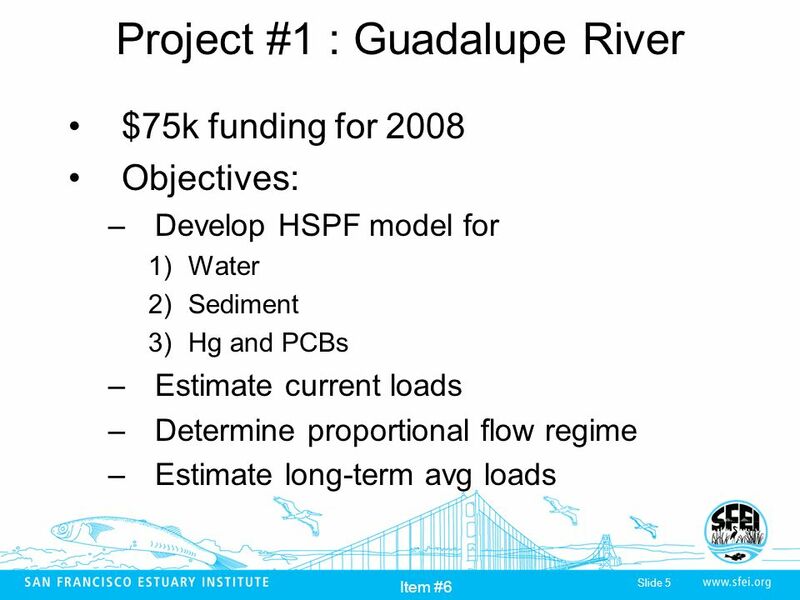 1 PCBs and PBDEs on the Guadalupe River WYs 2003 – 2006 John Oram, Jon Leatherbarrow, and Lester McKee Sources Pathways and Loadings Workgroup November. High Flow Studies (WY 2005) Lester McKee Sources Pathways and Loadings Workgroup. 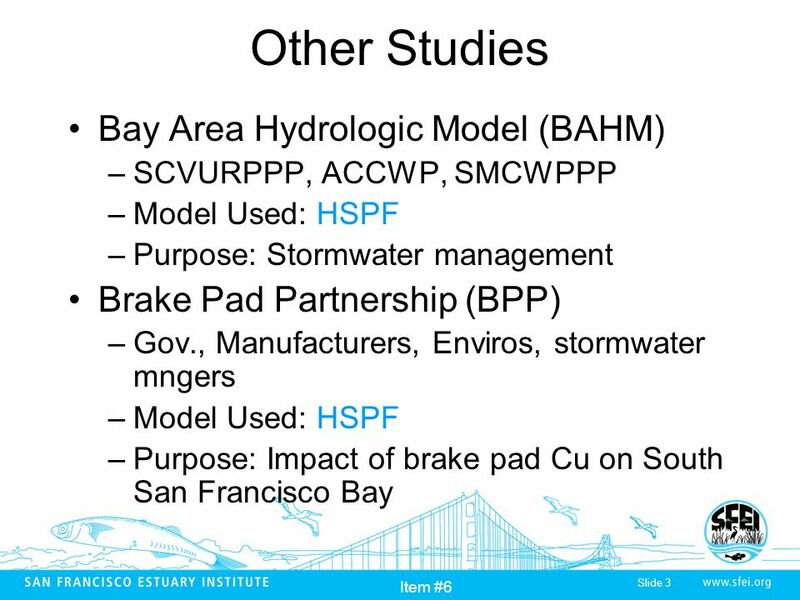 Brake Pad Wear Debris Characterization Mark A. Schlautman, Ph.D Christos Christoforou, Ph.D. Ashley Haselden School of the Environment Clemson University.